In 1999 the CDC listed “Ten Great Public Health Achievements of the 20th Century”. Family Planning is one. 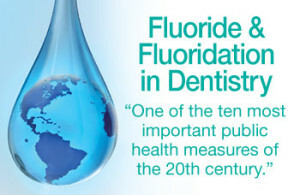 Another is “Fluoridation of Drinking Water to Prevent Dental Caries”. Last month three well-respected Durango citizens collaborated on an op-ed for the Opinion page of the Herald. Unfortunately much of what they wrote is not well supported. I know and respect all three—but feel that they didn’t do their homework well. The first author wrote: “The fluoride we add to Durango’s water supply is Hydrofluorosilicic Acid.” In December I asked the City’s staff what is used to fluoridate Durango’s water supply and received this answer: “Dr. Grossman: The fluoride additive utilized is Sodium Fluoride (NaF) with a finished water fluoride concentration goal of 0.70 ppm.” Message #1: ask questions. The assertion is made that water fluoridation causes arrested brain development, ADD and ADHD, decreased IQ, autism, learning disabilities and cancer. Writer #1 states: “More than one in six children are effected [sic] by these conditions.” What are the sources for this information? Presumably one journal, “Fluoride: Quarterly Journal of the International Society for Fluoride Research”. I find articles in this journal to be strongly biased—they all seem to be against fluoridation. How can one tell if a scientific journal is reputable, since many periodicals seem to be trustworthy, but are not? First of all, look to see if articles in it are peer reviewed. If they are not, the information is less credible. I check one thing before deciding on the credibility of a medical journal: is the journal listed in the National Library of Medicine? “Fluoride” is not. The second writer, a dentist, states “…I have never been able to distinguish which children (or adults) grew up in a fluoridated community or a non-fluoridated community.” This is not the sort of information with which to make educated decisions that affect the public’s health. Rather than just an impression, it would be more believable to have records of the rates of cavities where water is fluoridated and where it isn’t. I admire this writer for checking with the Cochrane review on water fluoridation. These reviews are the standard for evaluation of the quality of medical knowledge. He quotes: “There is very little contemporary evidence, meeting the review’s inclusion criteria, that has evaluated the effectiveness of water fluoridation for the prevention of caries.” Message #2: the research on the effectiveness of water fluoridation is old, but still valid. The third writer states that fluoride is “…an endocrine disruptor that is wreaking havoc with our thyroid glands….” This interests me for two reasons. The topic of endocrine disruptors is important, as there are many (especially organic) chemicals that cause subtle but serious problems. Additionally, I have taken thyroid medication for decades. I did some research to find out if there is good evidence that fluoride is an endocrine disruptor. What I found is that, indeed, preliminary evidence suggests that fluoride may have an effect on thyroid function. Some of the information is from England, where most salt is not iodized. Fluoride may make lack of iodine (which is essential for thyroid function) worse. This supports the idea that it is healthy to use iodized salt, but doesn’t necessarily go against water fluoridation. What is not mentioned by any of the three writers is that many of the studies showing bad effects of fluoride were done in places where the levels of water fluoride are very high. Those studies are not relevant to Durango, where the level is much lower. Message #3: read original studies to find relevance to our community. Public health’s goal is to facilitate health for all people. My understanding is that the Durango City Council made the decision to continue with a low level of fluoride in its water supply. This was a good decision from the standpoint of public health because it will benefit those who have the greatest need—people who can least afford dental care, and who may have the poorest diets. Those who feel strongly that fluoride is bad can arrange to drink water without it. I’ve lived more than half my life here in La Plata County and have reached a milestone. This month I turned 70. My only sibling, Clara, died too young at age 71, although our parents both lived to over 85. This is a good time for me to take stock. Writing this column for the Herald has been a real pleasure. I have had reason to research all sorts of subjects and to pretend that I’m an expert in them all. Thanks to the Herald for giving me a way to exercise my mind—and hopefully stave off dementia! It has been my great privilege to have been a part of so many people’s lives as a physician in our community. One of my greatest pleasures is to re-meet folks I have helped into this world. An unrealized goal was to deliver three generations of babies. It has been wonderful, however, to help deliver the sons and daughters of people I first met as newborns. One of my reasons for becoming a physician and then specializing in obstetrics and gynecology was concern about human population. The world’s population has tripled since my birth, and that of the USA has more than doubled. Because of economic development and our higher standard of living, human use of resources has been multiplied many times. My original reason for concern about overpopulation has to do with my wanting to work for peace. High population density, and thus competition for resources, is a common reason for war. I am still working to minimize this cause of armed conflict. However, now there are many other reasons for concern about population, including extinction of species and climate change. I have been accused of performing abortions only to slow population growth; this is not so! There are strong individual reasons, too—almost as many as there are women with unplanned pregnancies. I have a conundrum. Sometimes people comment on my quirky sense of humor, but it has not been exercised much when writing these columns. Perhaps the subjects I write about are just too serious for me to find ways to joke about them. I need help: if you can think of jokes about the future of the planet—climate change, extinction of species and overpopulation—please write me. I also have a bucket list—a list of things I would like to do while I still am able. One big item on the list is to continue exploring the world and our immediate surroundings. We still backpack, but the distances we hike before making camp are getting shorter. Fortunately our dog, Tyrone, helps carry stuff. Obstetrics has one unique disease that kills women and babies. Physicians have never figured out what causes preeclampsia (also called toxemia of pregnancy or Pregnancy Induced Hypertension); my bucket list includes researching its physiology. About 30 years ago I came up with a hypothesis—that PIH is the woman’s body’s way of compensating for the baby’s obstructing blood flow to the lower half of her body. I never got around to testing this theory, but I hope to do start that study soon. One of my successes has been to learn enough Spanish to be able to function medically in that language. This has been a help to the many immigrants (and their wives) who do much of the low-paying labor in our area. Recently I have volunteered at the La Plata Community Clinic where Spanish is valuable. It seems strange, after limiting my practice to just women for so long, to also care for men, but they are rewarding. This clinic deserves our community’s support. I am fortunate that my life is still exciting. Gail and I just celebrated our 47th wedding anniversary. We still enjoy each other’s company, and she has been a wonderful support. I feel very lucky that we found each other. It has been a great pleasure to be a part of the Durango community, and that of the Herald. Thank you all—including those of you who disagree with me—for being part of my life. Please join me in celebrating my transition to geezerhood! Wonderful news! The Symposium at the 2012 Telluride Mountain Film Festival will have as its topic POPULATION ! Paul Ehrlich and Dave Foreman will be two of the speakers. It should be exciting! I’ve never been to a Telluride Film Festival, but will be there this year. The dates for the whole festival are May 25th to 28th–Memorial Day Weekend. The Symposium will be held 9 am to 3:30 pm on Friday the 25th. I’ll see you there!